Enrollment starts at the Front Desk Hub. 1) First thing to check is that your hotel name is showing at the top of the screen. 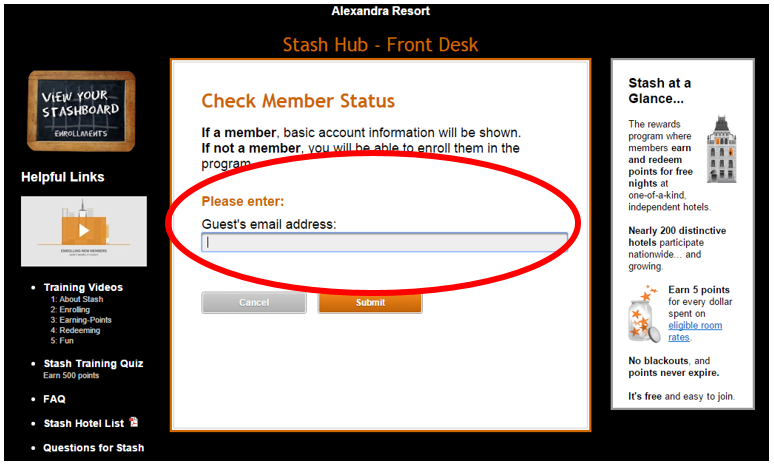 If an incorrect hotel name is showing, let your Stash Champion know immediately. They can contact us for the correct link. 2) Establish that a guest is not a member to begin the enrollment process. 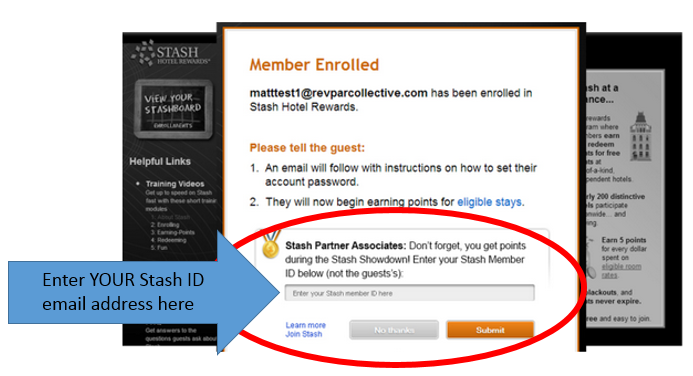 REMEMBER: You must verbally ask each guest if they would like to join Stash Hotel Rewards and they must say “Yes” BEFORE enrolling them. Once you have the verbal confirmation you can begin the enrollment process. 3) Enter the email address the guest provides you with. Let them know that this email address will be their Stash ID. 4) You’ll then enter YOUR NAME. Remember to enter your name the same way each time. This is how we track enrollments for Showdown prizes. If you enter your name as John Doe the first time and JOHN DOE the second time, you will create 2 different tracking aliases. You don’t want this to happen. 5) Next you enter the guests first and last name. 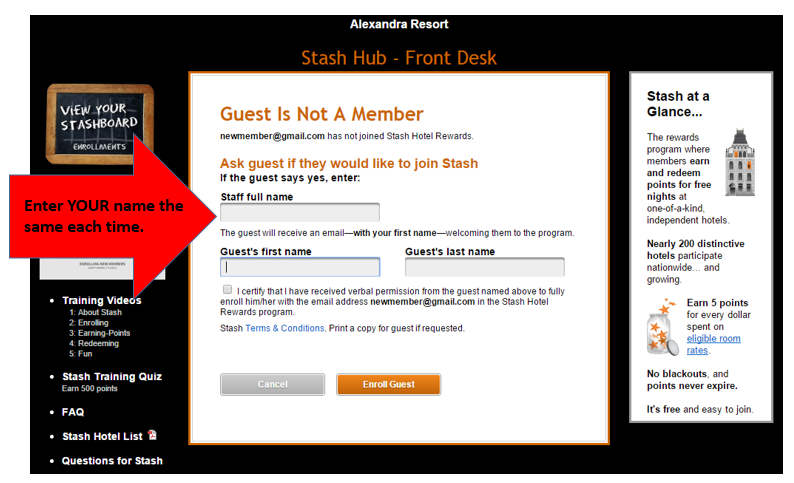 6) Before clicking the box that says “I certify that I have received verbal permission from the guest named above to fully enroll him/her with the email address ___________________ in the Stash Hotel Rewards Program.” YOU MUST receive a verbal “Yes” from the guest. Failure to do so will result in consequences such as enrollments removed, points forfeited, disqualification from Stash Showdown, and the possibility of further, more severe penalties. Once you get the verbal “Yes”, check the box, hit Enroll Guest and you’re done! 7) Congratulate the guest on joining an amazing program and pat yourself on the back for another enrollment in the books. 8) Be sure to enter the new member’s Stash ID (email address) in you PMS. And it must be an exact match or you won’t get credit (or points) for a Qualified Enrollment during Showdown. 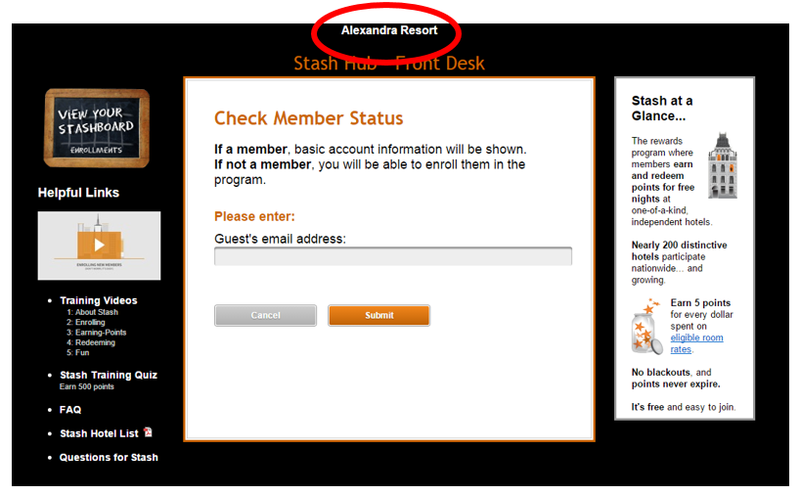 9) Once you’ve enrolled the member, you’ll see a new text box on the “Member Enrolled” screen. Here you enter YOUR Stash ID email address. Still have questions on how to enroll correctly? Reach out to us here and we’d love to help!